Aughagower, or Aghagower which translates from Irish (Achadh Ghobhair) as ‘the plain of the springs’ is a small, historic village approx 5 miles from the town of Westport in County Mayo. 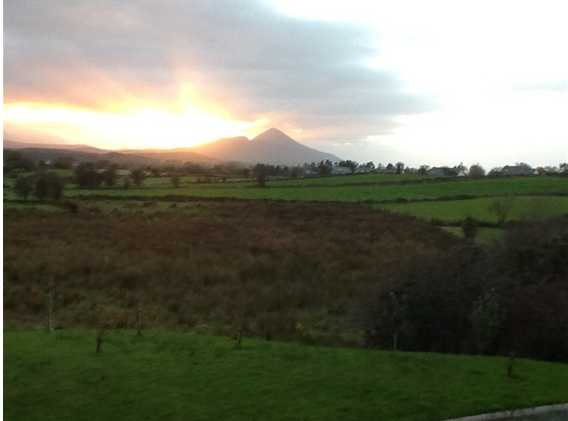 It is situated mid-way along the Tochar Phadraig ancient pilgrimage route from Ballintubber Abbey to Croagh Patrick. One of the monuments still in existence is the ‘Leaba Phadraig’ (St Patrick’s Bed) where the saint is reputed to have slept. Pilgrims performed stations between the bed and the holy well, Tobair na nDeachan (the well of the deacons) which has now dried up. 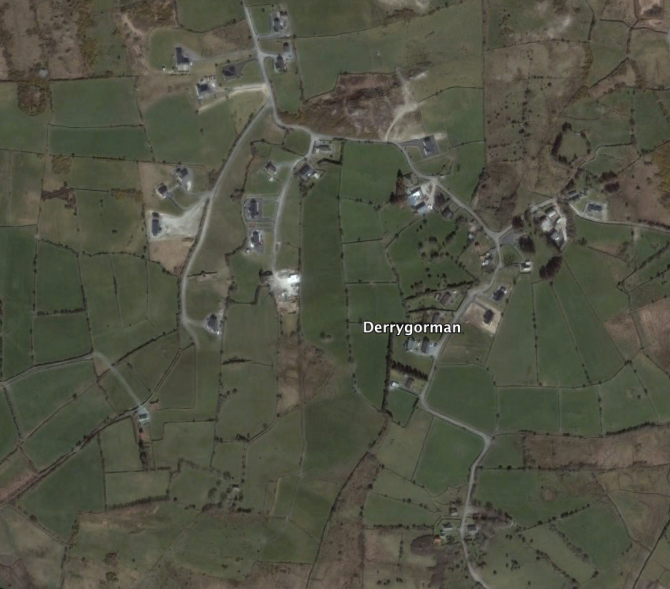 Within this Parish is a townland of Derrygorman. Derrygorman lies just outside Westport, County Mayo. 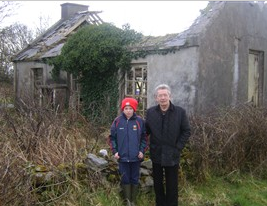 We have now in 2014 discovered that this is where our branch of the Stanton family originated in 1800. derrygorman. (doire mhic gormáin , mac gorman’s oak wood is a townland in the civil parish of aughagower and baronyof murrisk . – to the north is the townland of derrygorman. 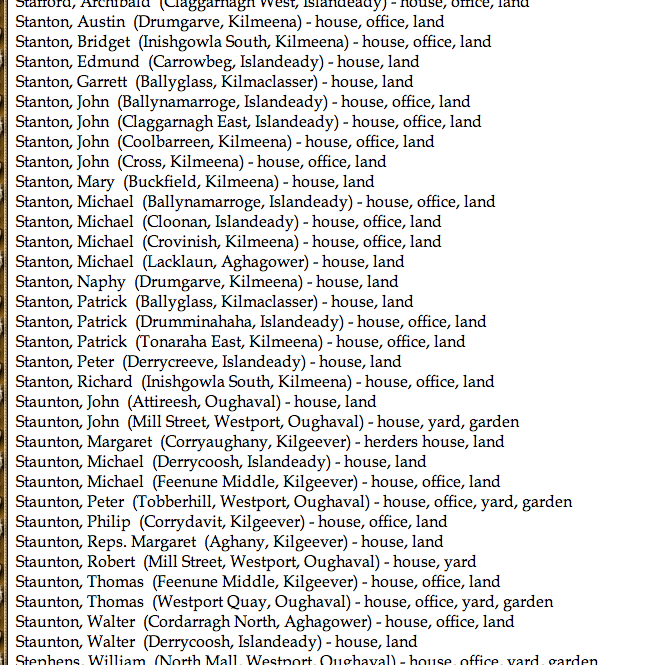 references: category:townlands of county mayo. . ordnance survey map of mayo 1838 http://www. 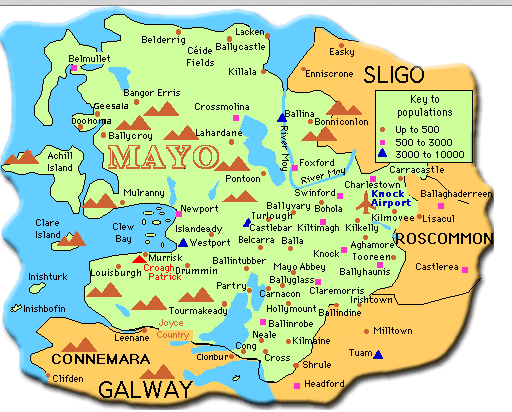 AUGHAGOWER,a parish, partly in the barony of MURRISK, but chiefly in that of BURRISHOOLE, county of MAYO, and province of CONNAUGHT, 4 miles (S. E. by S.) from Westport; containing 12,045 inhabitants. 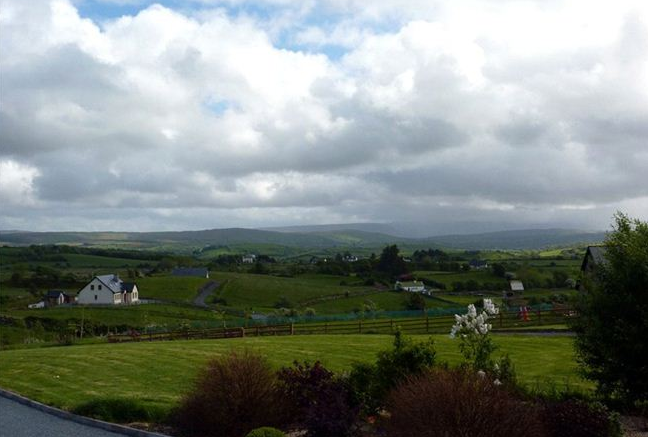 It is situated on the confines of the county of Galway, and on the road from Westport to Ballinrobe: the greater portion is mountain, about one-tenth only being under tillage; about 100 acres are woodland, and there are large tracts of bog. The system of agriculture is in a very rude and unimproved state, spade husbandry being still prevalent to a considerable extent. Lead mines have been opened in the mountains, which are the property of the Marquess of Sligo, but they are not worked at present; and there is a large quarry of slate of a very heavy quality, which is not now in operation. Mount Browne House, now the seat of J. Browne, Esq., was, during the disturbances of 1798, the seat of the Right Hon. Denis Browne, brother of the Marquess of Sligo, and was for some time in the possession of the insurgents. There are six schools, situated respectively at Ayle, Ardygommon, Cushinkeel, Aughagower, Triangle, and Lanmore, in which about 700 children are taught; and there is also a hedge school at Carranmore of 50 boys and 40 girls. The only antiquities are a round tower in the village, and the remains of an old castle at Doone. St. Patrick founded here the monastery of Achadfobhair, and placed St. Senach over it: it afterwards became the parish church. Open to the sky, having no roof the tower is preserved up to the fourth floor (approx 16m). The original east-facing doorway is round-headed and 2.2m above the present ground level. It is about 1.5m high and 65cm wide. A later doorway at ground level – 1.6m high x 75cm wide – faces north-west. A monastic settlement still existed here in the 13th century but little is known about it. Transcriptions from Aughogower Cemetery Archives include a Walter Stanton who died in the year 1937. We must assume that Walter is a direct ancestor of our Walter born circa 1800 in the same Parish. My granddad went to a country school in Derrygorman. The school opened in 1862 and closed in 1976. There was two teachers Mr. Padraig Mc Laughlin and Miss Sweeney. There was just one room in the school. There was about twenty-five pupils in the school. One teacher taught in one half of the room and the other teacher taught in the other half. All the children in the school were in the same room. He learned English, Irish, math’s, history and geography. They didn’t use biro’s they used a pen with a nib on it and dipped it into an ink well. There was no TVs. Computers, mobile phones, school uniforms and there was no central heating. All the children used to take it on turns to bring turf to school for the fire. In the summer time they used to walk to school in their feet. Grandad lived near the school and they all walked to school every day. There was no school transport or cars. The ruins of the school is still there. This is a picture of the ruins of the school my Grandad went to. He lived in Derrygorman. He lived with his mum, dad, sister and four brothers. They had a small 3 bed roomed house. He ate rabbit stew, bacon, cabbage, potatoes, vegetables brown bread, eggs and porridge . They grew their own potatoes and vegetables. They had hens and they got their eggs and they milked the cow for milk. Grandad mum used to bake the breadGrandad worked on the farm when he came home from school. When he was fourteen he finished school and he went to work in Myles Staunton’s shop and store on James Street in Westport. Grandad worked in the shop first and then when he was seventeen he drove their delivery van to the country shops delivering wholesale. Thanks for posting on Derrygorman. 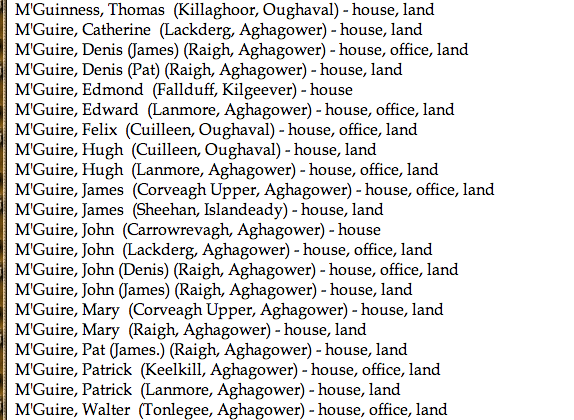 My ancestors, the Coynes, are also from Derrygorman. One of them married a Stanton and moved to Philadelphia. Exchange information? Would love to hear more about your line Jim. Please e.mail direct on quilietti@blueyonder.co.uk.